When the 12th Submarine Flotilla was active at Kylesku, and the Isle of Bute, 'Special Forces' were embryonic, so these daring activities were carried out by selected Royal Navy personell. Eventually, 'Special Forces' developed and the Royal Navy was one of the leaders in that. 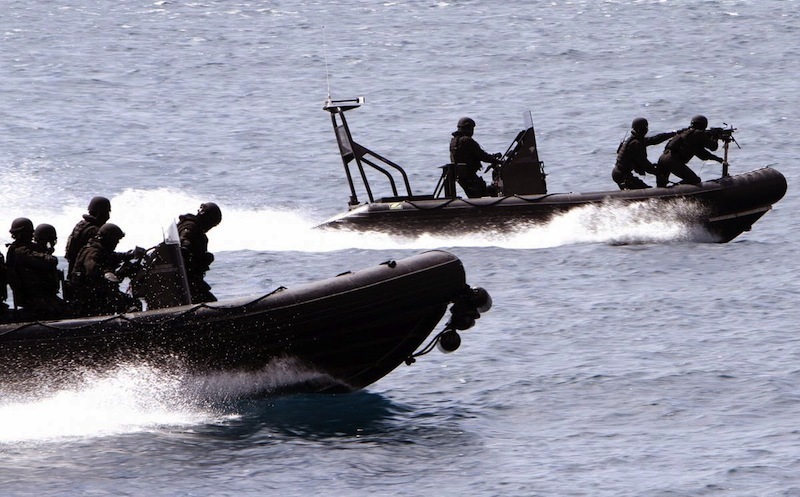 At the present time the Special Boat Service (SBS), as in photo above, is the Royal Navy's equivalent of the Army's Special Air Service (SAS). Although trained to operate on water, it is also capable (and often has) operated on land, far from the sea. It originated in 1940 in an almost comic way (see History in 2) below), went through various name-changes, including disbandment in 1946. Wikipedia puts this rather well in the link 2) below. Whatever their name at the time, they did sterling service during WWII, such as that done by X-Craft and Chariots from Kylesku and elsewhere, and continue to this day. '... the Welman was a submersible craft 20 feet 6 inches (6.25 m) in length (including explosive charge), weighing about 2,000 pounds (910 kg). Unlike the "Chariot" human torpedo, the operator was enclosed within the craft, and did not need to wear diving gear. The Welman could transport a 425-pound (193 kg) time-fuzed explosive charge of Torpex, which was intended to be magnetically attached to a target's hull. Vision was through armoured glass segments in the small conning tower, and no periscope was fitted'.